Players can freely adventure through the world of Eorzea for another 30 days as the floundering Final Fantasy XIV extends its free trial period for the second time. It's safe to say that no matter how pretty Final Fantasy XIV may look, Square-Enix's new MMO hasn't been doing so hot. After a beleaguered beta, the game launched with some baffling and frustrating design elements. 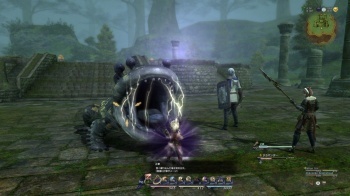 Feedback was so harsh that Square-Enix extended the initial month-long free trial period for another 30 days, and CEO Yoichi Wada seemed resolute in his declaration that the JRPG studio would work to regain gamers' trust. It looks like that trust hasn't been earned back just yet: In an announcement on the FF14 blog, Square-Enix revealed that the free trial period would be extended by another 30 days - meaning that players will have been able to play the MMO for 90 days without ever paying a cent beyond the cost of the game itself. The blog post also reveals that the first of two "large-scale version updates" designed to bring about "significant improvement to the FF14 experience will be hitting in late November - tentatively dated for the 25th - with the second scheduled for mid-December. MMOs are expensive to develop and run, and three months of letting players play for free - while paying the dev team to work on improving the game's missteps - can't have been easy on Square-Enix's pocketbook. Hey guys? Maybe next time you should think about releasing a game that isn't broken.